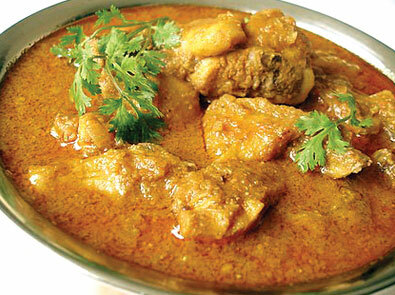 We hope you enjoy this Kerala Chicken recipe. If you have any Indian recipes that you would like to to add to our site then please click here. This recipe serve two people and takes about 25 minutes to prepare and another 30 to cook. Take a largish pan and heat some oil with the crushed garlis, chilly powder and coriander. Throw in the grated cocconut and gently saute for a few minute. When the cocconut has gone a dark brown, add a small amount of water, let it cool and mash together to form a thick paste. Heat some more oil in the pan and add the green chilly, chopped bay leaf (or curry leaf) and the finely sliced onion. Gently heat untill the onions go brown all over. Add some tumeric. Put in the chicken, red chilly, half a pint of water and the cocconut paste you made earlier. Add salt to taste and cook untill the chicken is nice and soft (about 20 minutes). Top it all of with a fresh sprig of coriander and serve with Basmati Rice or some type of Indian bread.